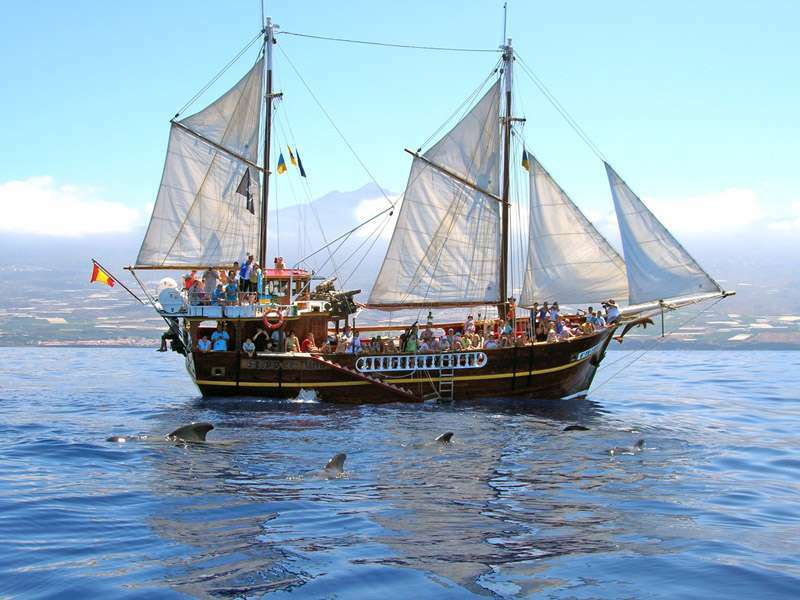 After a snack and a drink, we will leave the harbour of Los Gigantes to look for the dolphins and/or whales. 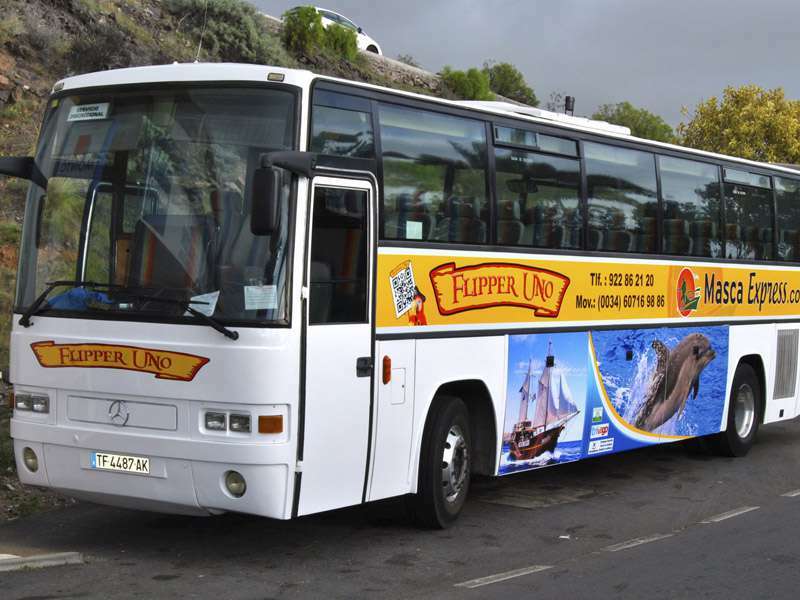 We guarantee that you will see one ore the other with the Flipper Uno. 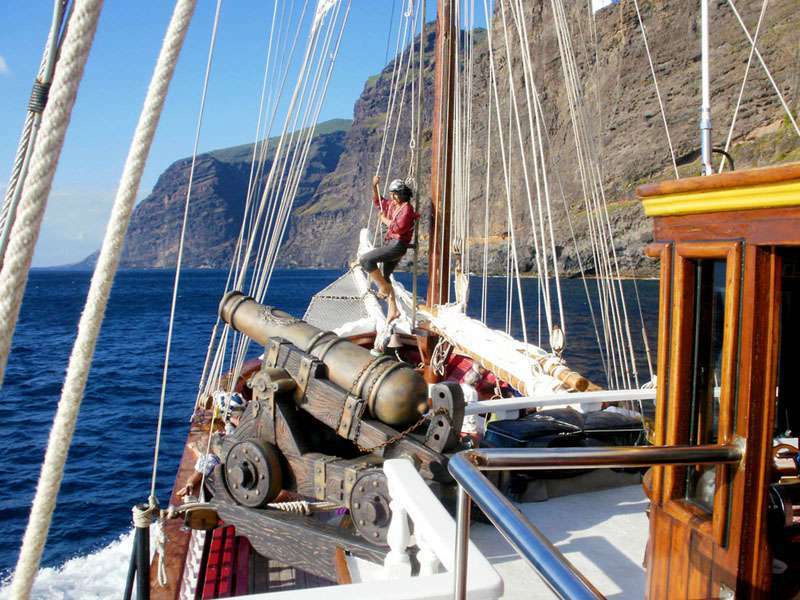 After we have enjoyed the dolphins and/or the whales, we will set sail along the cliffs of Los Gigantes and Masca. These are one of the highest cliffs in the world, with peaks of almost 600 meters. In one of the beautiful bays with its sparkling clear water, you have time for a swim. Going into the water is easy down the steps or spectacularly swinging from our trapeze. After your swim we will serve you a lovely lunch; paella based on chicken breast and vegetables. We will also serve you some bread and a piece of fruit.. Red wine, beer, cola, fanta and water are available to drink. During the excursion all drinks are included in the price. 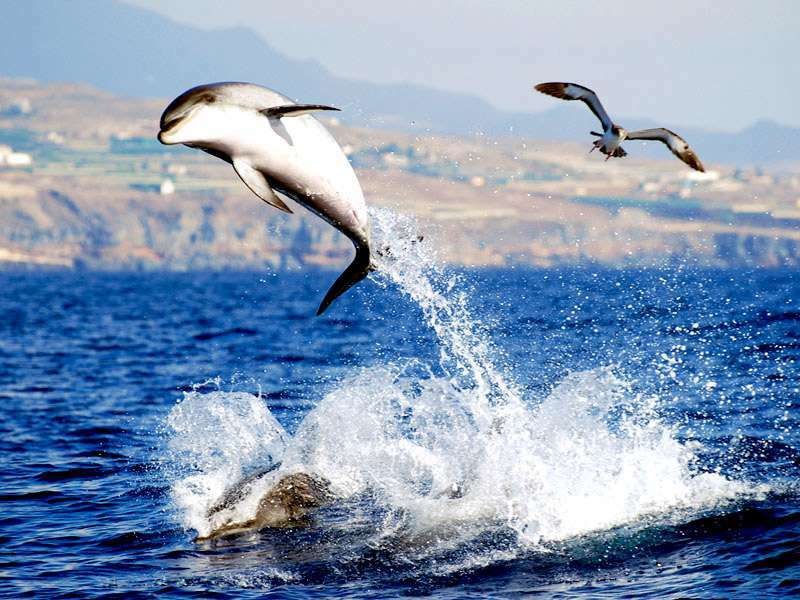 After a snack and a drink, we will leave the harbour of Los Gigantes to look for the dolphins and/or whales. We guarantee that you will see one ore the other with the Flipper Uno. 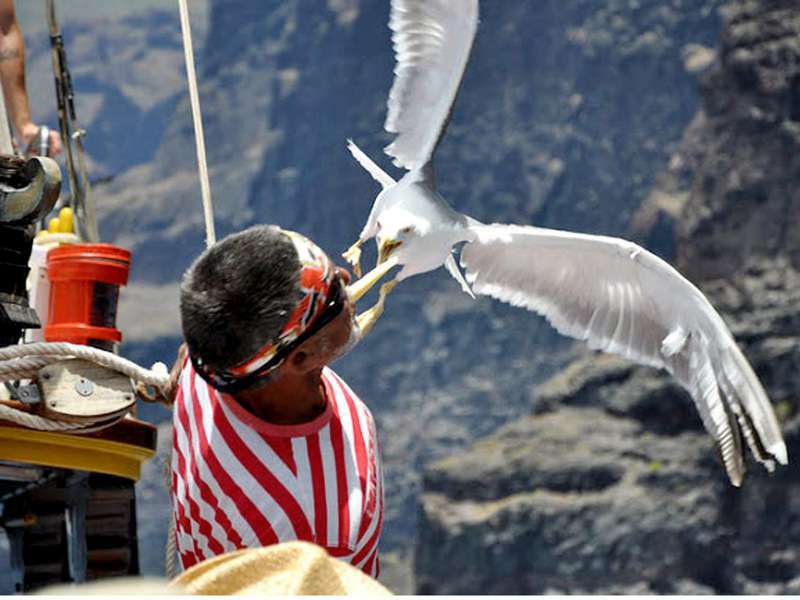 After we have enjoyed the dolphins and/or the whales, we will set sail along the cliffs of Los Gigantes and Masca. These are one of the highest cliffs in the world, with peaks of almost 600 meters. In one of the beautiful bays with its sparkling clear water, you have time for a swim. 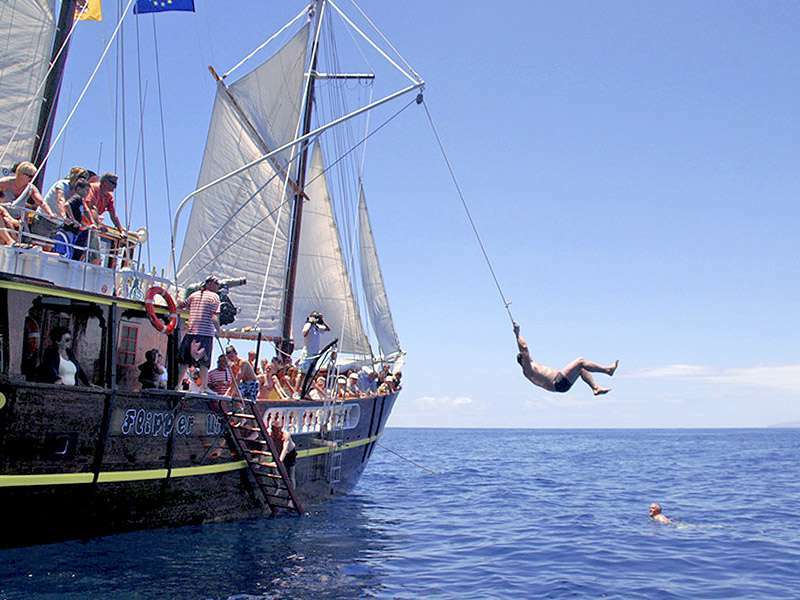 Going into the water is easy down the steps or spectacularly swinging from our trapeze. After your swim we will serve you a lovely lunch; paella based on chicken breast and vegetables. We will also serve you some bread and a piece of fruit.. Red wine, beer, cola, fanta and water are available to drink. During the excursion all drinks are included in the price. 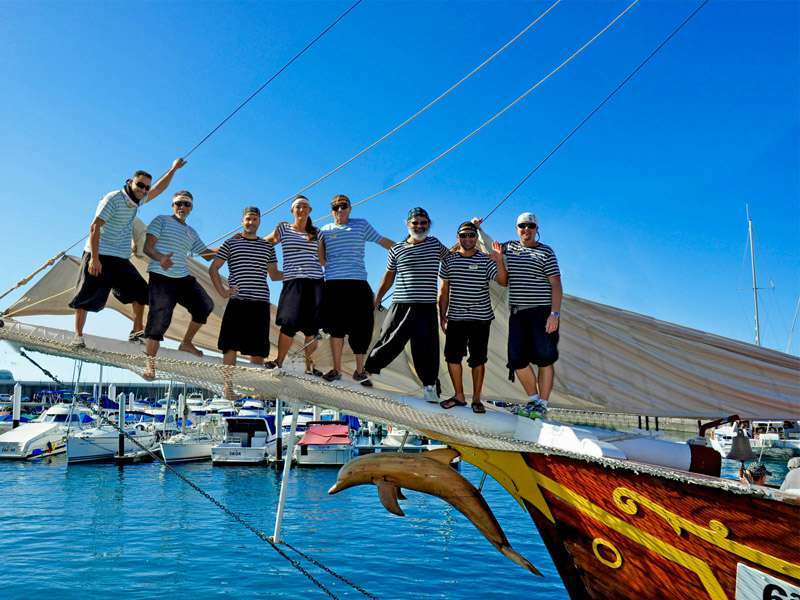 We have an official guide on board who will explain everything in your own language. 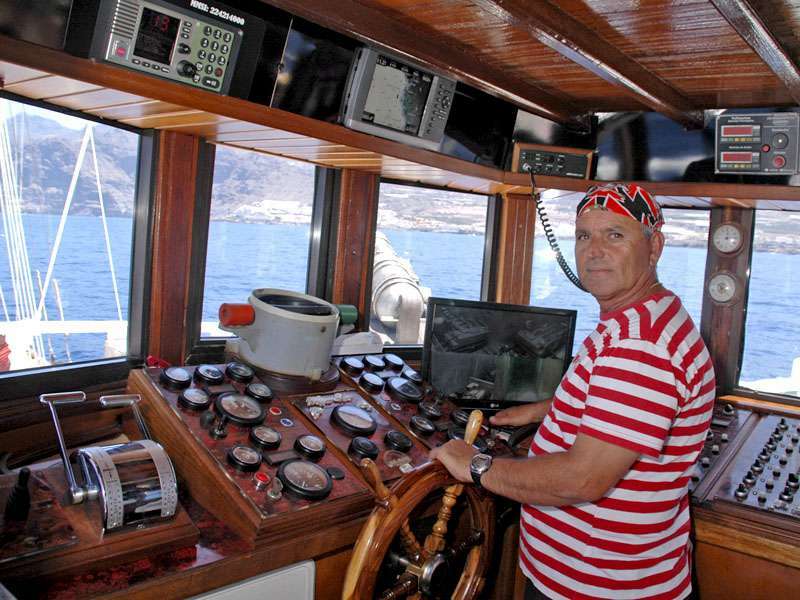 After sailing 3 hours we will be back in the harbour of Los Gigantes. Don’t forget to bring your swimsuit, camera and your sense of fun!! 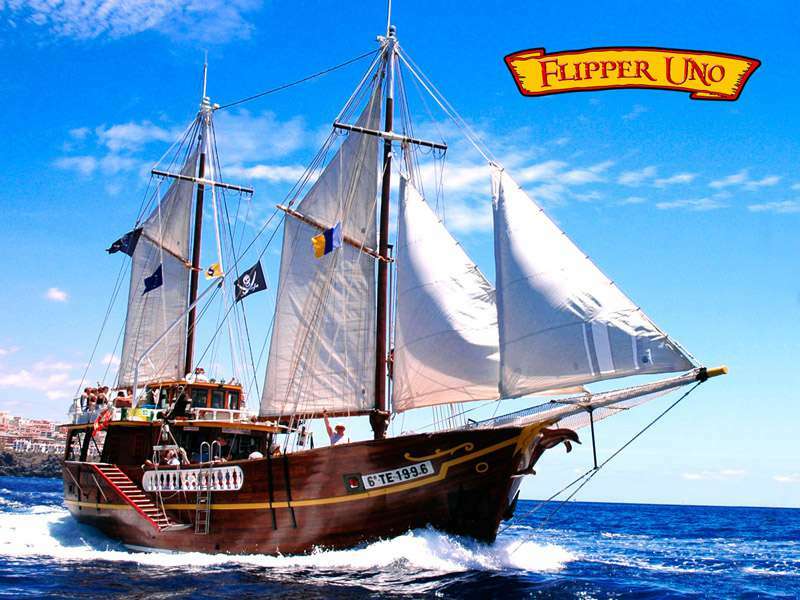 See you soon at the Flipper Uno!!! After a snack and a drink, we will leave the harbour of Los Gigantes to look for the dolphins and/or whales. 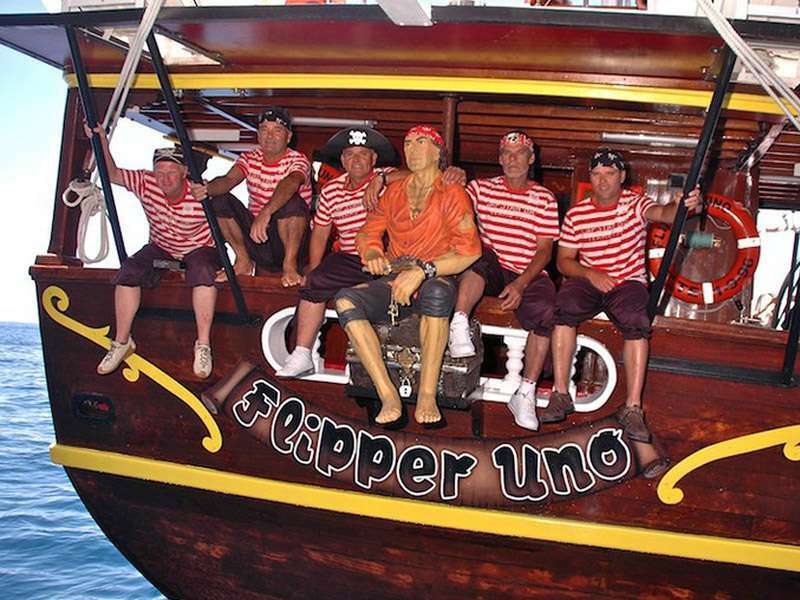 We guarantee that you will see one ore the other with the Flipper Uno. 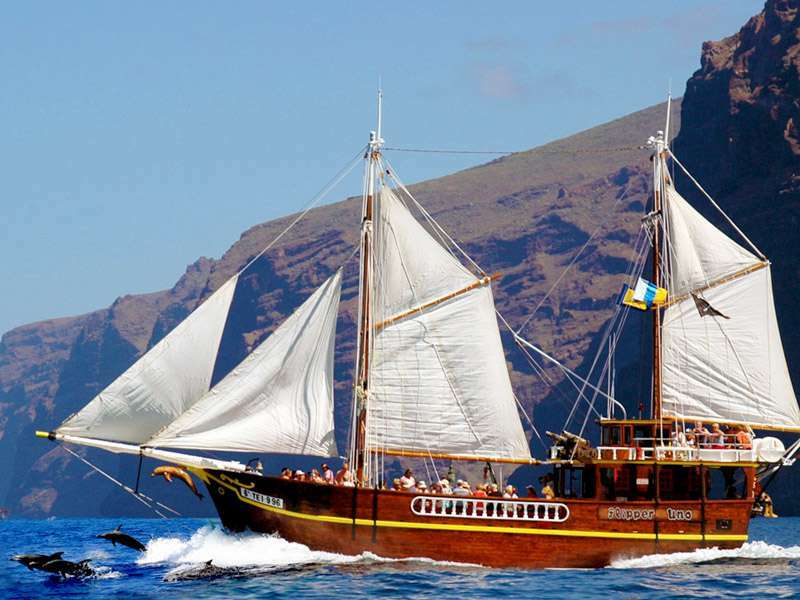 After we have enjoyed the dolphins and/or the whales, we will set sail along the cliffs of Los Gigantes and Masca. These are one of the highest cliffs in the world, with peaks of almost 600 meters. In one of the beautiful bays with its sparkling clear water, you have time for a swim.Going into the water is easy down the steps or spectacularly swinging from our trapeze. After your swim we will serve you a lovely lunch; paella based on chicken breast and vegetables. We will also serve you some bread and a piece of fruit.. Red wine, beer, cola, fanta and water are available to drink. During the excursion all drinks are included in the price.We have an official guide on board who will explain everything in your own language. 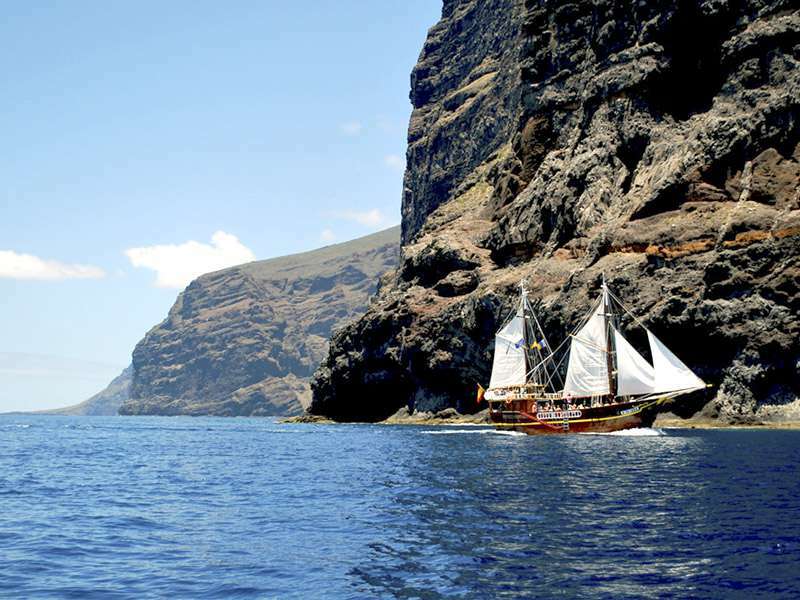 After sailing 3 hours we will be back in the harbour of Los Gigantes. Don’t forget to bring your swimsuit, camera and your sense of fun!! See you soon at the Flipper Uno!!! Nice ship, very kind staff, we had a chance to see the dolphins and swim in the ocean. Although the trip took less than expected, overall it was a pleasant experience - Dina (I hope I remember her name correctly) was absolutely fantastic taking care of people in need (sea sick!! :)) and especially of my little son who was the only one from our familiy not suffering of sea sick - so he was in front of the boat and the rest of us trying to cope in the back :))) The dolphins were absolutely fantastic - so I would definitely recommend it.